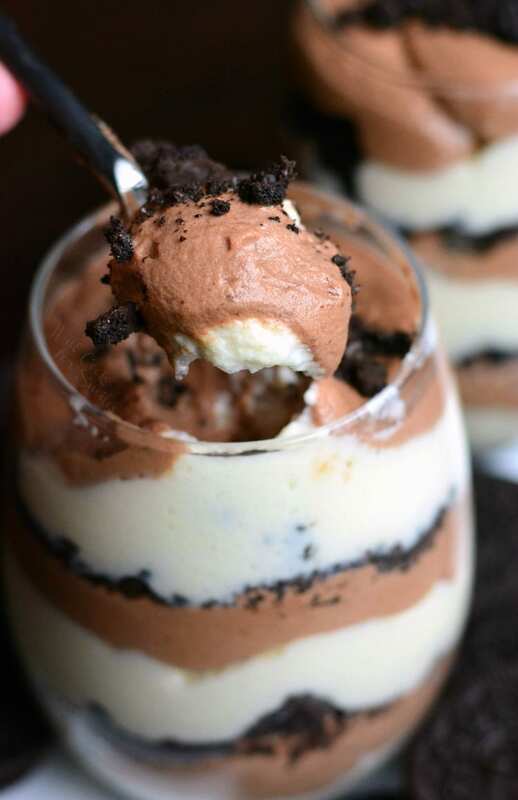 These amazing double chocolate mousse parfaits are perfect for sharing with someone special. 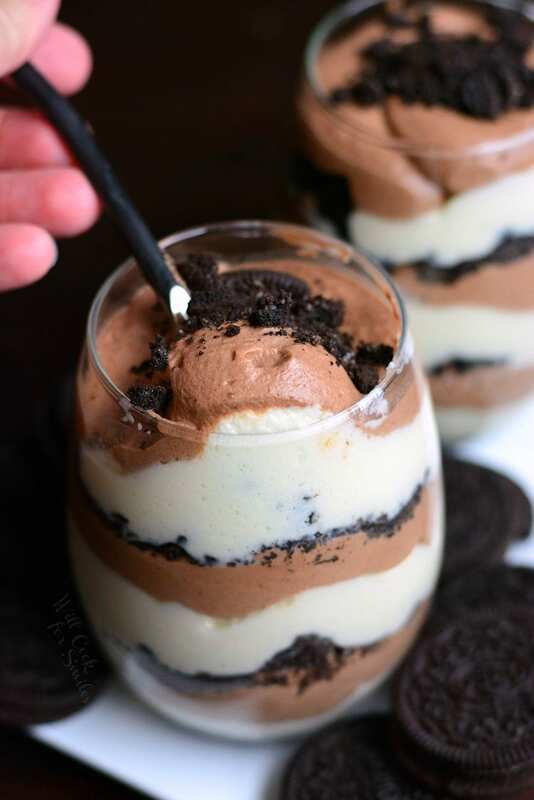 Two types of lighter than air chocolate mousse are layered with crunchy Oreo cookie crumbles. 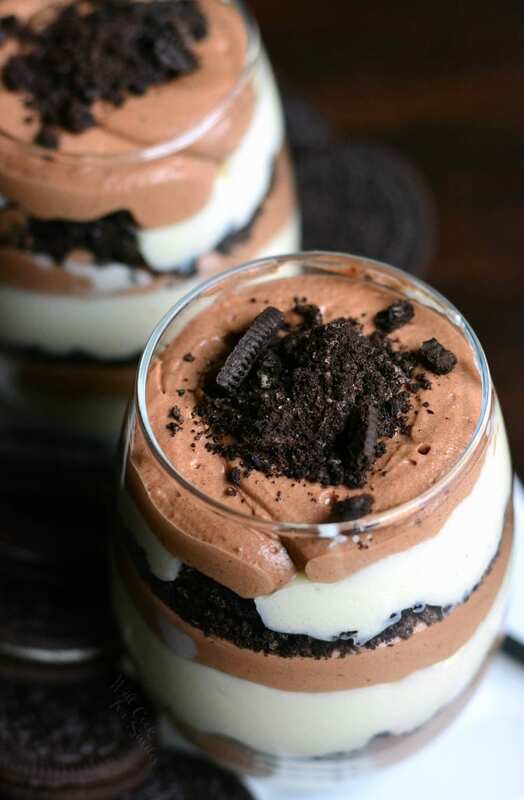 Each bite combines white chocolate mousse, dark chocolate mousse, and some Oreo cookies to create a heavenly experience. So who’s got some amazing plans for Valentine’s Day? To be honest, I’ve got nothing planned and I even had to look up what days of the week it falls on. I used to be a lot more excited for Valentine’d Day before kids and before serious jobs. It was a lot more fun when I was young and my main “jobs” were school and growing up. I remember the pressure of finding a date for Valentine’s Day because you can’t be the only one to show up to school the next day and not have a story to tell about the date. It seems so petty now but back than, it was quite important to go out to dinner and get chocolate, flowers, and giant stuffed animals. The bigger the better! Even looking back to middle school and elementary school, it seemed so important to get as many valentines from your friends as possible. And maybe, you will get a very special valentine from the boy/girl you had a crush on forever. The special valentine was the best part of going to school on Valentine’s Day. Valentine’s Day is quite different when you have little kids. I’d love to wake up late to a smell of delicious Bananas Foster Pancakes all ready for me. I’d love to eat them in bed while watching an awesome action movie with my hubs. Then, I’d love to go out and spend all day wandering around town, eating different treats from local shops. Finally, to finish off the day, I’d love to go out to our favorite Brazilian Steakhouse for dinner. Unfortunately, I will be waking up in the wee hours of the morning to a hungry little baby and feed her half asleep. Then, the bigger one wakes up and wants his breakfast. After the kids are fed, I hug my coffee maker and make myself a huge cup of coffee and quickly make myself some eggs before school starts. The rest of the day is the blur between the kids and work. Every day is about the same, Valentine’s Day or not. All is not lost though and even busy parents can make Valentine’s Day special. 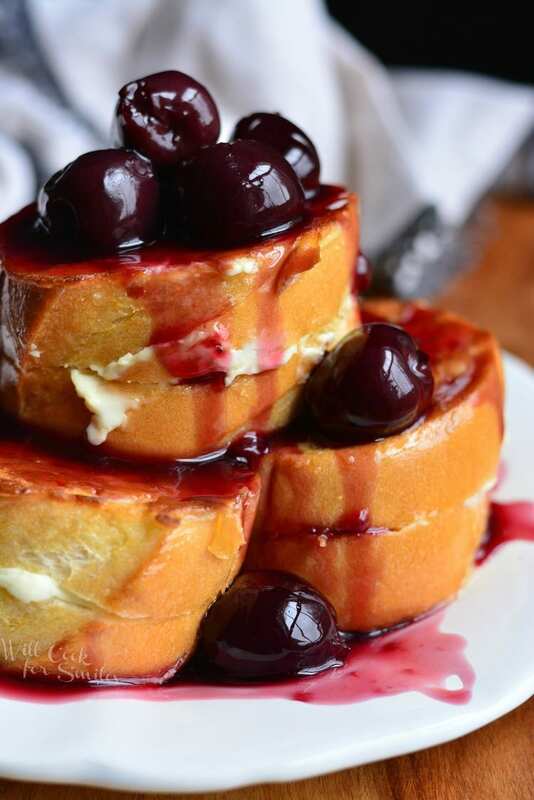 Older kids can help make a special breakfast for the family. Super lucky parents may be able to find a baby sitter (even though it’s nearly impossibly of this holiday). And the rest of us, less lucky parents, can make a special dinner at home…followed by an EXTRA special chocolate dessert. 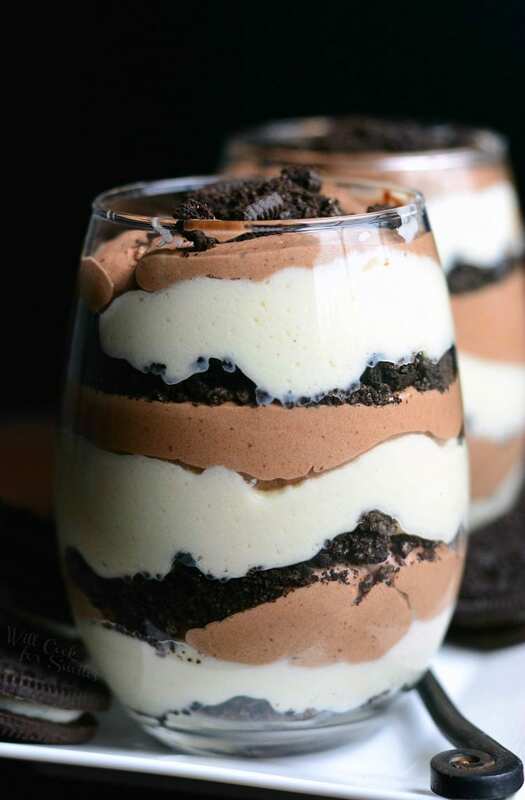 It doesn’t get much more special than a heavenly, lighter than air, DOUBLE chocolate mousse parfait! (Use whisk attachment for frosting.) 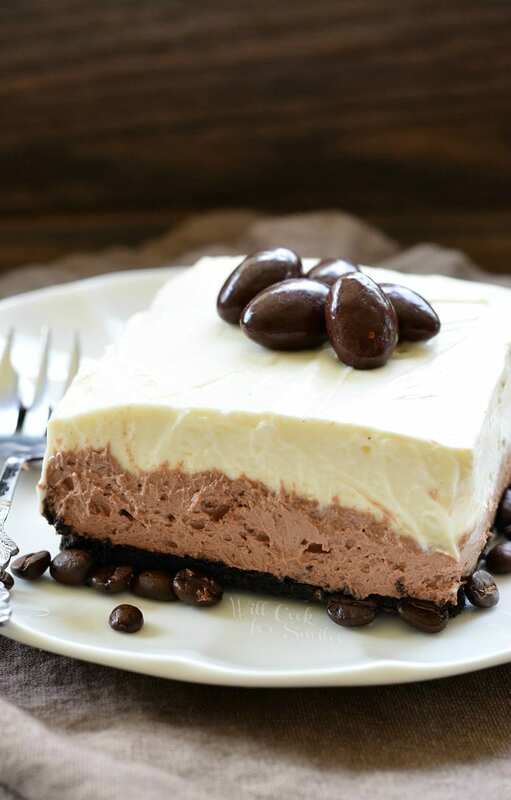 In a bowl of an electric mixer, add mascarpone cheese, heavy whipping cream, and vanilla extract. Start on low speed to mix the ingredients and gradually increase the speed over a few seconds to medium-high. Beat until it starts to thicken and lower the speed to add sugar. Pour in sugar and raise the speed again. Beat on medium-high speed until stiff peaks form and gradually lower the speed, over a couple of seconds. Do not walk away, this will be ready fast! Fold in COOL whip topping into the whipped mixture and refrigerate for about an hour. Melt the dark and white chocolate bars separately. You can use a microwave just make sure to heat it through on half power and in the increments of 45-30 seconds, stirring in between each increment. Let chocolates cool a bit. Divide whipped mousse mixture in half and gradually stir/whisk in dark and white chocolates into each half by drizzling the chocolate in while stirring. Transfer each chocolate mousse into a separate piping bag. 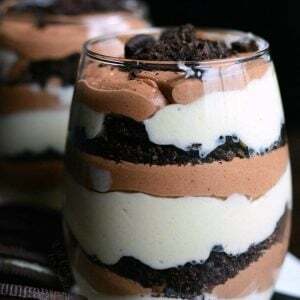 Layer each mousse and cookies on top of each other. 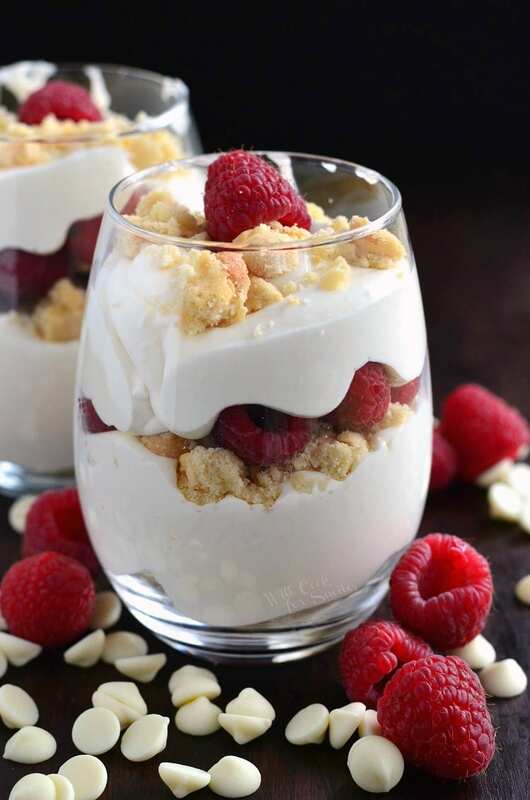 You can create 3 large parfaits or 6 small ones. Once in incorporate my chocolate to the mousse it firm up and doesn’t mix well… what did I do wrong? ?